A three hour friendly titillation for all who thought about joining or wanting to explore the captivating world of Drag King's, hosted by Rogue Drag King with guest Drag King's Adam All and The Drag King. 2.What is a Drag King and a brief account of the history of Drag Kings - A summary and hand out of a description of and history of Drag Kings you can take with you. Breast binding – disguising the curves and is not compulsory! Performing masculinity on stage – we will supply the demonstrations of how to act, physicality, performance and how to stand, walk and talk like a man. There will even be the opportunity for the confident princes to strut their stuff to a song of your choice! 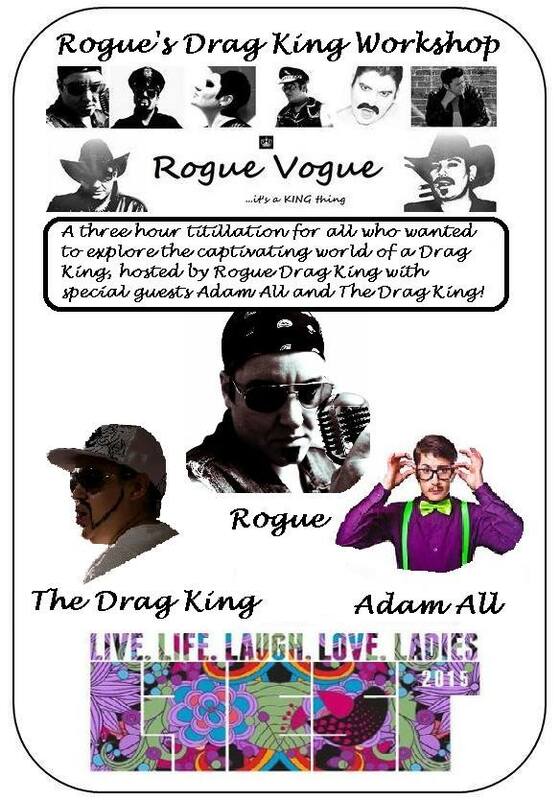 4.The Performance - a short performance byRogue, Adam All and The Drag King.